Seeing Seattle on a budget can be difficult. You need a travel guide for how to visit Seattle. As with any large city, there are plenty of ways to spend your money here while getting little value in return. Take a look at some money saving tips for Seattle and the Pacific Northwest. For a city so far north, Seattle's winter weather is relatively mild. Although the urban areas don't get huge amounts of snow, keep in mind the higher elevations receive a lot of it. The rainy season is November-March. Summer temperatures are also mild: a warm day is 80 degrees. Even in July, you'd be wise to pack a jacket. In summer, you're likely to encounter crowds and find fewer bargains, especially in places that attract lots of tourists. May and September are two months in which both rainfall and crowd totals are diminished. In addition to your routine airfare searches, check the sites of budget airlines such as Frontier and Southwest for attractive fares. The airport is known as Sea-Tac (short for Seattle-Tacoma). A taxi from the airport to downtown generally runs about $35 USD. But Bus #194 Express or Route #174 are only $1.25 (off-peak) to $1.75 (peak). Major interstate routes are I-5 (north-south) and I-90 (east-west). Vancouver, B.C. is about 150 miles to the north. Portland, Ore. is roughly 175 miles south of Seattle. Finding a Seattle car rental is usually not too difficult, because all of the major companies have large offices here. If you are a U.S. citizen and plan to visit Canada during your trip, remember that you will need a valid U.S. passport to re-enter the country. Mass transit here is called Metro and includes a large selection of buses. Unfortunately, sales of visitor passes were discontinued at the start of 2009. Is Seattle the starting and/or ending point for a cruise? As you do your hotel search, ask about special rates and arrangements. For budget accommodations, check hotels south of the city and within a few miles of the airport. AYH Ranch Hostel on Vashon Island is in a beautiful Puget Sound setting and makes a great hotel alternative in warmer weather. Prices start at $15/night and go to $65 for private rooms. Downtown, the Green Tortoise Hostel is located close to Pike Place Market and other attractions. If you're looking for an upscale stay without the huge room rate, consider the Paramount Hotel at 8th and Pine. About's Go Northwest Guide offers an excellent menu of restaurants in the Seattle area. Famous for seafood and strong Seattle coffee, the area also offers some wonderful budget grub that is an experience in itself. A chain called Than Brothers offers delicious and low-cost soups from authentic Vietnamese recipes. Pike Place Market is perhaps the most "touristy" spot in Seattle. It is here you can see fishmongers tossing large salmon and watch the day's catch weighed and stored. The market is now 100 years old and attracts 9 million visitors each year. You'll find 190 shops and dozens of restaurants here. Try to avoid the pricey nearby parking garages. Seattle is also a key aviation center. You can book a tour of the Boeing production facility (adults pay $20) that will take you into the world's largest building by square footage. Mount Rainier National Park is worth a daytrip during a visit to the Pacific Northwest. 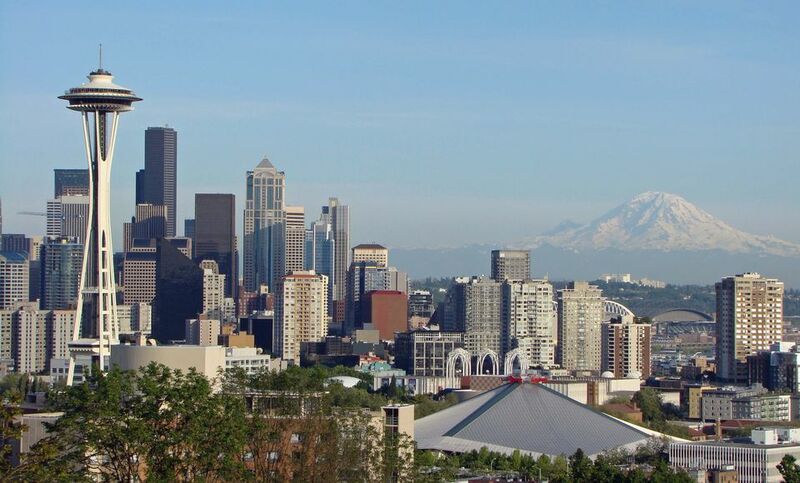 The mountain is visible in clear weather from Seattle, but it's an 85-mile drive to the park from the city. The vehicle entry fee is $20-$25, which entitles you to park access for seven days. If you plan to do mountain climbing above the 10,000 ft. level, you'll need a $30 permit. Another natural gem in the region is Olympic National Park which is accessed via Hwy. 101 ($20 fee). This is not a day trip--it usually requires a commitment of several days -- but the forests and Pacific coastline you'll see are worth the investment. Campsites and lodges in the national parks and elsewhere fill up quickly. Summer visits to Olympic and Mount Rainier national parks should be planned carefully. These popular spots not only attract visitors from throughout the world, but also weekend visitors from the nearby large cities of Portland, Seattle and Vancouver. For a budget travel splurge about two hours from Seattle near the entrance to Olympic N.P., consider a stay at Alderbrook Resort and Spa along Hood Canal near the town of Union. Hood Canal is actually a 65-mile fjord. Vancouver is a long day trip. Often listed among the world's most beautiful cities, Vancouver, British Columbia is just 150 miles north of Seattle. Be warned that traffic can be heavy at times, and lines at the border for customs clearance can create substantial delays. If you only have one day, it's worth a try, but you'll have a better experience spending the night in Vancouver and returning another day. Check road conditions in winter. Many mountain roads are closed during the winter months, while others close as conditions dictate. Be sure to phone ahead for the current situation to avoid wasting time and money traveling to a place that's closed. Enjoy Seattle's eclectic music scene. Seattle's excellent symphony and opera companies offer visitors some great moments, but the city is also known for its grunge music scene that peaked in the 1990s. There are still post-grunge clubs and record stores attracting visitors. Don't take Seattle's "Rain City" reputation too seriously. As with San Francisco, there are micro-climates here that make for big changes within just a few miles. Places such as Whidbey Island tend to be fairly dry, while other locations are wet. Even during rainy season, there are outdoor activities in full swing. Pack a rain jacket or umbrella and enjoy!